Don’t you just love a filling, hearty salad that’s super easy to prepare? I am normally not a salad person, because it just doesn’t fill me up and sustain my blood sugar high levels. But add some protein like chickpeas and quinoa and I am set! 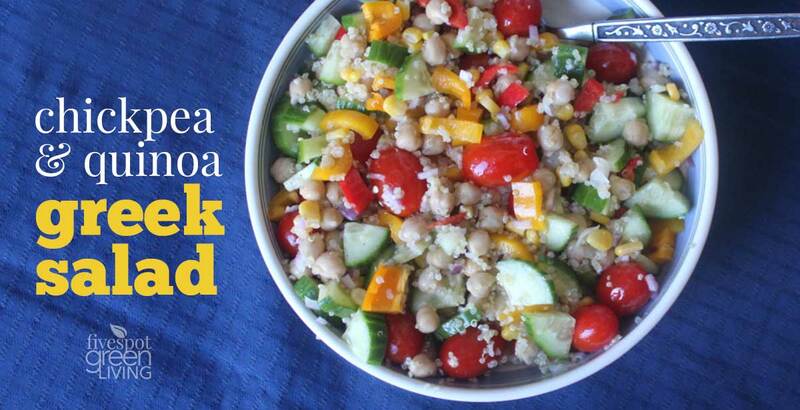 Try this Chickpea and Quinoa Greek Salad for your lunches or light dinner and add it to your healthy recipes rotation! Vegetarian Chickpea salad with olives, feta, tomatoes, onion, garlic and a light lemon dressing! 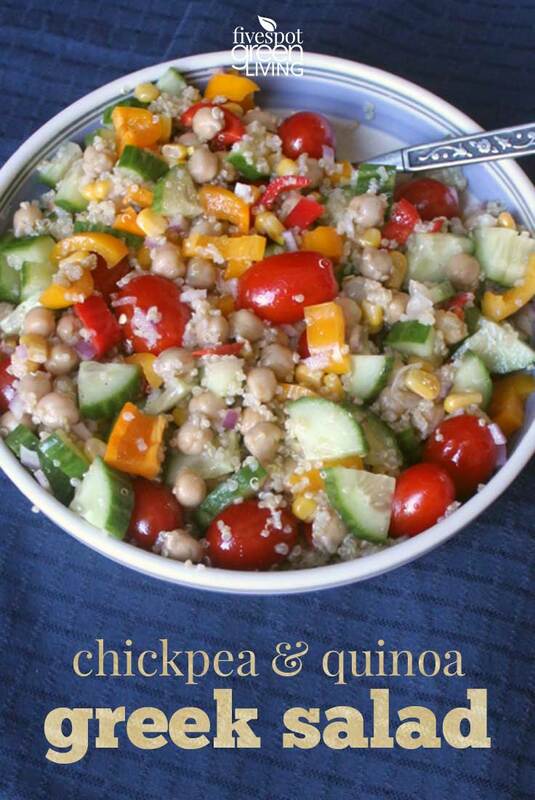 Add quinoa for more protein or enjoy on it’s own! 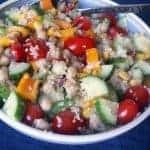 This is a great salad for summer BBQs and picnics works great as a quick lunch for work. In a small bowl, whisk together olive oil, lemon juice, garlic and oregano. Pour onto salad and toss again to well combine. Taste and add salt and pepper as you'd like. Place in refrigerator for 1 hour to marinate, or serve immediately. Salad is best enjoyed within 2-3 days after making. 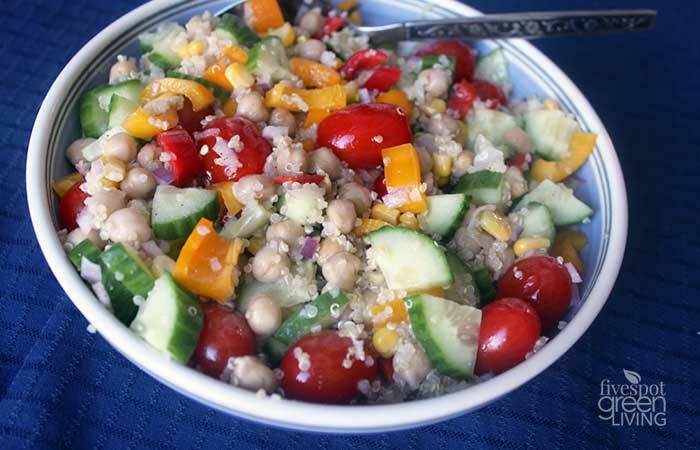 I love simple grain salads like this. Your recipe looks so fresh and vibrant, yum! that looks so good, and won’t take forever to make, which is awesome because I really don’t have much time to waste. 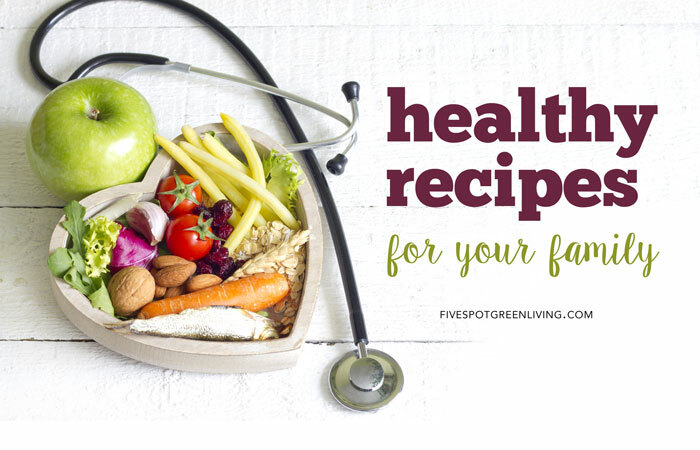 Thanks for that healthy recipe, Blessings! Healthy & delicious! Thanks for joining the Creative K Kids’ Tasty Tuesday linky party – I look forward to seeing what you share next week! An interesting twist on a Greek Salad. Looks delicious. I’m always looking for quinoa recipes. Thanks for sharing at the #HomeMattersParty!